Many people are drawn to the idea of hanging upside down to relieve back pain or improve posture, which it can. Always, however, ease into hanging upside down. Use an inversion table, which allows you to control the degree to which you invert. You can lie horizontally, at zero degrees, or go all the way upside down at 90 degrees. If you feel any uncomfortable side effects, such as headaches, invert yourself at a lower angle or discontinue use of the inversion table. The first time you use the table, invert yourself between 20 and 30 degrees to get accustomed to these angles for a few weeks. You should feel completely at ease before proceeding to a greater angle of inversion. A total body stretch, increased blood circulation and more oxygen getting to the head are positive effects from hanging at even this mild angle. After you become used to being inverted at about 30 degrees, you can proceed to 60 degrees. 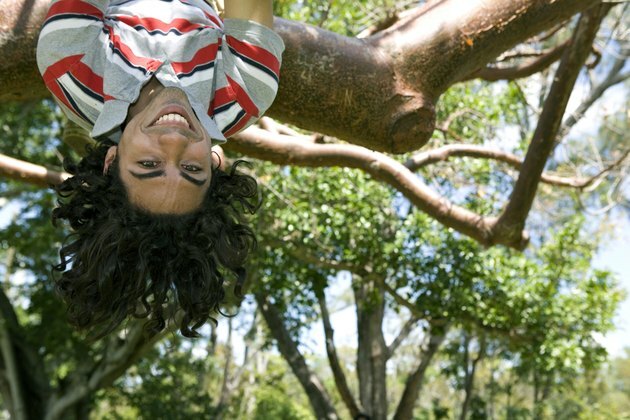 Hanging upside down is healthy for your spine, as it allows gravity to gently pull and create traction. Traction is a process chiropractors perform to decompress their clients' spines and create space between the vertebrae. When a person lies on the inversion table and is two-thirds of the way upside down, gravity can naturally allow the spine to decompress, provided you relax your body. Inverted traction has been shown to be an "effective means of achieving pelvic traction at home," according to a study published in "Archives of Physical Medicine and Rehabilitation." As you're inverted, your vertebrae in the lumbar or lower region are pulled away from each other. Hanging completely upside down will give you all the stretching and spinal benefits as inverting. Anyone with significant muscle or tension, such as those who exercise frequently, might need to hang completely upside down so gravity can work harder to stretch the stronger muscles and soft tissue. Alternate between full or partial inversion and returning to an upright position in 30-second increments. This back-and-forth method will increase your circulation more than remaining in a single position. Another approach is to hang upside down at 90 degrees by using gravity boots hooked into a metal bar stuck in a door frame. This will not allow you to control your angle; you can only do hanging straight upside down, but you will still get the benefits of a stretched and decompressed spine this way. Inversion has been shown to reduce instances of lower back pain. According to an article in the "Los Angeles Times," inversion can be risky for people with certain conditions because the blood flow to the head increases and the body is put in an "unnatural inverted state." Anyone with high blood pressure, glaucoma, weak bones or with heart or circulatory disorders are discouraged from being inverted. Women who are pregnant or who are obese should also consult a doctor before attempting inversion.